David Lawrence "Dave" Hlubek (/ˈluːbɛk/ LOO-bek; August 28, 1951 – September 2, 2017) was the lead guitarist and founding member of the Southern rock band Molly Hatchet. David Lawrence Hlubek was born in Jacksonville, Florida. At the age of 5 or 6, Hlubek moved with his family to the naval base in Oahu, Hawaii, where he attended Waikiki Elementary School. From there, Hlubek's father was transferred and the family moved to Sunnyvale, California, then to Mountain View, and finally settling in San Jose, before moving back to Jacksonville, Florida, in 1965. There he attended and graduated from Forrest High School. Hlubek founded the band Molly Hatchet in 1971. Vocalist Danny Joe Brown joined in 1974, and Duane Roland, guitarist Steve Holland and bassist Banner Thomas joined in 1974, and Bruce Crump in 1976 replacing original drummer and childhood friend Freddie Bianco . Hlubek was also the original vocalist when they started, as well as becoming the band's most prolific songwriter; writing or co-writing the majority of the group's songs, including their most famous, "Flirtin' with Disaster". When they finally signed their recording contract with Epic Records, they received help and advice from Lynyrd Skynyrd vocalist Ronnie Van Zant, who was originally supposed to produce their first album but was killed in a plane crash in 1977. While most people tagged Molly Hatchet as "Southern Rock," Hlubek admits it was only because of their location. He considered Molly Hatchet, along with Blackfoot, to actually be heavy metal bands from the South. In fact, he also said that, although hard to talk about, it was the demise of Lynyrd Skynyrd, who were on top of the world at that time, that opened the door for Molly Hatchet. In 1987, Hlubek was replaced by lead guitarist Bobby Ingram. Hlubek, by his own admission, being "unbearable" due to rock star excess and substance abuse, left the band. "I had a horrendous, horrendous cocaine problem". Hlubek then found himself at rock bottom and unemployed. His close friend Mazz moved him out of Jacksonville to Port St. Lucie, Florida, offering him moral support. Acting as Hlubek's personal manager, Mazz negotiated recording sessions and gigs and created bands featuring Hlubek. These included: Hlubek & Friends, Southern Jam Band, and the Southern Rock Legends (with the latter including former members of both Lynyrd Skynyrd and Blackfoot). After getting his life back together, Hlubek also worked with other bands including the Dixie Allstars, renamed Southern Rock Allstars which he co-founded with Blackfoot drummer Jakson Spires. In 2003, he joined forces with former Lynyrd Skynyrd guitarist Mike Estes, his drummer Kurt Pietro and Finnish musician Pontus J. Back, when Estes and Back founded the band Skinny Molly. 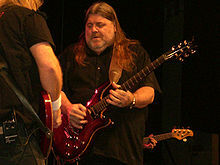 In January 2005, Hlubek rejoined Molly Hatchet. Due to health issues, David Hlubek had slowed down with touring and flying. David Hlubek spent this down time working on his musical history with a ghost writer. The book is scheduled to be released mid November 2018. He was still an active member recording and playing when he was able, until his death on September 2, 2017. In addition to writing the hits "Flirtin' with Disaster", "Gator Country", Whiskey Man", and "Fall of the Peacemakers" that Molly Hatchet is known for, Hlubek has also written several movie soundtracks. These include the feature films Monster starring Charlize Theron, The Dukes of Hazzard, Suspect Zero, and Delta Farce. Dave Hlubek has seven gold- and platinum-selling albums with sales totaling approximately $24 million. Prior to his death Hlubek spent many hours recording his life with intentions of providing a book for his sons. Hlubek died of a heart attack on September 2, 2017 at the age of 66. He is survived by his two sons, Kyle and Aaron. ^ "Dave Hlubek, founding member of Jacksonville band Molly Hatchet, dead at 66". Florida Times-Union. 3 September 2017. Retrieved 28 July 2018. ^ "KAOS2000 Magazine interview with Dave Hlubek of Molly Hatchet". Kaos2000.net. Retrieved 3 September 2017. ^ "Molly Hatchet Founder, Dave Hlubek, Dies at 66 - Best Classic Bands". Bestclasscibands.com. 3 September 2017. Retrieved 3 September 2017.